Naw-Rúz: The links below contain more information about Holy Day Observance of the Naw-Rúz, the Bahá’í New Year, which begins on the evening of March 19th (the end of the Bahá’í Fast) and ends at sunset March 20. Ridván: Ridván means paradise, and is named for the Garden of Ridván outside Baghdad, where Bahá’u'lláh stayed for twelve days in April 1863 after the Ottoman Empire exiled him from the city and before commencing his journey to Constantinople. 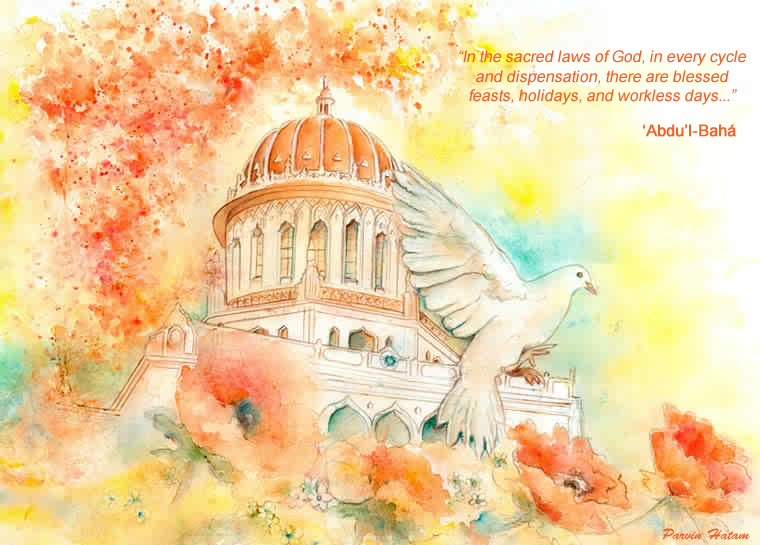 There are three significant Holy Days during the Ridván Festival: the first day of Ridván on April 20th marks Bahá’u'lláh’s arrival, the 9th day, April 28th, the arrival of his family and the 12th, May 1st, day for their departure from the Ridván garden. Declaration of the Báb: May 23rd is day when Bahá’ís commemorate the Báb’s declaration, the herald of the Bahá’í Faith – in which He announced in Shiraz, Persia (now Iran) on the evening May 22nd 1844 – two hours after sunset – that He was the herald of a new messenger of God. Ascension of Bahá’u’lláh: On May 28th, at 3 a.m., Bahá’ís observe the anniversary of the passing of Bahá’u’lláh, the founder of the Bahá’í Faith – who was in exile outside Akká (also known as Akká or Acre), in what is now northern Israel. Martyrdom of the Báb: July 9th, 12 noon. The Báb, Forerunner to Bahá’u’lláh. proclaimed a New Day was dawning and the coming of Baha’u'llah would fulfill all the prophecies of the past. His Message, like that of Christ, brought the wrath of the religious leaders of the time and he was martyred in July of 1850. Birth of the Báb: The day is an observance of the anniversary of the birth on October 21st. The Báb was born in Shiraz, Persia (now Iran) in 1819, of Siyyid ‘Ali-Muhammad, who later took the title of “the Báb,” meaning “the Gate.” The Báb was the herald of the Bahá’í Faith. The day is one of the nine holy days of the year when work is suspended. Birth of Bahá’u’lláh: Bahá’ís observe the anniversary of the birth of Bahá’u’lláh on October 22nd (born Mirza Husayn-’Ali) in Tehran, Persia (now Iran) in 1817. Bahá’u’lláh, which means the “Glory of God,” is the founder of the Bahá’í Faith. It is one of the nine holy days of the year when work is suspended.